One of the first things to consider on Valentine’s Day is obviously a card, and one option that you may want to choose is A Heartfelt Valentines Day Card. What says I love you more than a heartfelt card? In addition to getting a gift, a card is essential. This card is quite simple but effective, can be bought at the Neovian Press, and definitely does the trick! However, if you’re feeling slightly more creative, why not impress them with a Homemade Valentines Day Card? This card might be slightly more personal, and the pet or person on the receiving end will be delighted at your effort! As well as buying a card for your Neopet, you may also want to go down the more cliché Valentine’s Day route, and splash out a little on some flowers and chocolate? All Neopets love chocolate, don’t they? If you’re on a budget, I recommend the Box of Yooyuball Chocolates, as not only are they delicious, they are also Altador Cup themed, which are perfect for any sporty Neopet! Even though the Cup is over, why not reminisce over good times while eating these yummy chocolates? Another good choice for chocolates, but in the appropriate theme of Valentine’s Day are a box of Heart Shaped Chocolates. This beautiful box is especially perfect if you want to spend a little more on your Neopet to show them your love and appreciation! Both are equally as tasty though, so I mainly recommend this box if you are worried about the presentation of the gift, and want something to fit the theme of Valentine’s Day. For Neopians with exquisite and expensive tastes.. If you wanted to buy flowers on a budget, the Bowl of Flowers is very pretty and bound to brighten up any Neohome, as well as bring a smile to someone’s, or your Neopets face! Alternatively, you could buy the Embellished Tuskaninny Flowers which double as a beautiful gift and also a wearable item for your Neopet, for those interested in dressing up nice. These are a few thousand Neopoints more expensive than the Bowl of Flowers, but they are definitely worth it if you are looking to dress up your Neopet with some flowers! Now that the cliché Valentines gift ideas have been given some consideration (which by all means make great gifts so don’t discount them! ), we can start thinking about perhaps more heartfelt and meaningful gifts, especially ones that will never be forgotten by that special someone. If you really wanted to spend a lot of neopoints on your Neopet this Valentine’s Day, you could take a trip to the Rainbow Pool accompanied with a lovely paintbrush, to try out a brand new colour for your pet! Some great, but significantly cheaper paintbrushes for your pet are: Snow Paint Brush (approx. 28k), Biscuit Paint brush (approx. 98k) and Glowing Paint Brush (approx. 54k). These are great options for Neopians on a budget, and will still make your Neopet look fabulous without spending too much neopoints. However, for those who have a lot more, and are willing to spend, perhaps you just won the Neopian Lottery, so why not celebrate the holiday in fabulous style and paint your neopet Pink, in true Valentines Day form?! Painting your Neopet pink would be a true embodiment of this celebration, but remember, once the festivities are over, you may come to regret your choice. However, if both you and your Neopet dislike pink, some of Neopia’s newest and best loved Neopet colours are: Polka Dot (approx. 1.4mil) and Maraquan (approx. 4mil). However, if your Neopet is already painted its favourite colour, don’t worry, there are plenty of other great gift ideas that your Neopet will love! For some gift ideas, you could consider toys or Usukis for your pet to play with! Or, you might want to treat your pet to some new fancy clothes for this special day. For perhaps the musical Neopet, how about a Fire Kazoo? The kazoo is one of Neopia’s favourite toys, and it is very cheap and simple, so you can’t go wrong with this. The fire paint on the kazoo brings another element to it, for a cool design on a simple toy. How better to express love than by getting your Neopet one of their favourite toys? Additionally, if you wanted to be musical in a Valentine’s theme, you could always buy your pet a Valentine Kazoo. This effectively plays the exact same music as the Fire Kazoo does, but is definitely more suited for any Valentine’s celebrations that you may be having! With a nice little heart shaped decoration, this kazoo can still be played all year round for any pet who likes music, or maybe a good addition to any potential kazoo collections? There are also plenty of other toys out there that are perfect for all types of Neopet, not just to suit the musical ones. Why not consider a plushie? All pets have their favourite plushie, or maybe even own a plushie collection, so this could be a great chance to add to that collection. 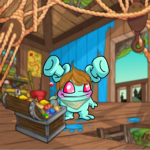 In Neopia, plushies come in all different types of Neopet and colour, and vary from just as little as 1np to thousands of neopoints. This is a great way to display thought and creativity in a gift, and you are also certain to give something that any Neopet is bound to love and appreciate. So there you have it, a comprehensive list of ideas of what to buy your pet this Valentine’s Day! No matter how much you spend, I am sure whoever is on the receiving end will greatly appreciate your thought. Peace and love to all on this day! Make sure to tell your Neofriends and Neopets how much you love them! Lisha heard some incomprehensible murmuring grow louder as she walked toward the eastern courtyard. In the distance, she made out a small shadow stretched out over the walls, covering the cobwebs and Spyders hiding underneath. That shadow eventually developed into the shape of a Wocky, and Lisha subsequently recognized the low, nasal voice as Danner’s. The man himself was leaning against the wall, repeatedly rotating his thumbs around one another.